As someone who really enjoys fine dining, I was spending a lot of time looking into options at the higher end in Ho Chi Minh City. 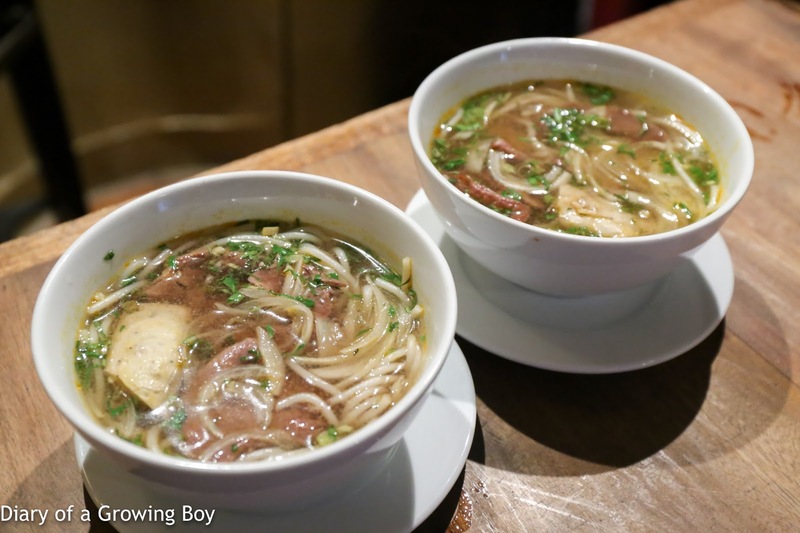 Unfortunately there seems to be a dearth of fine dining options when it comes to Vietnamese cuisine, and I certainly wasn't gonna waste precious stomach space and money to have French food in Vietnam. 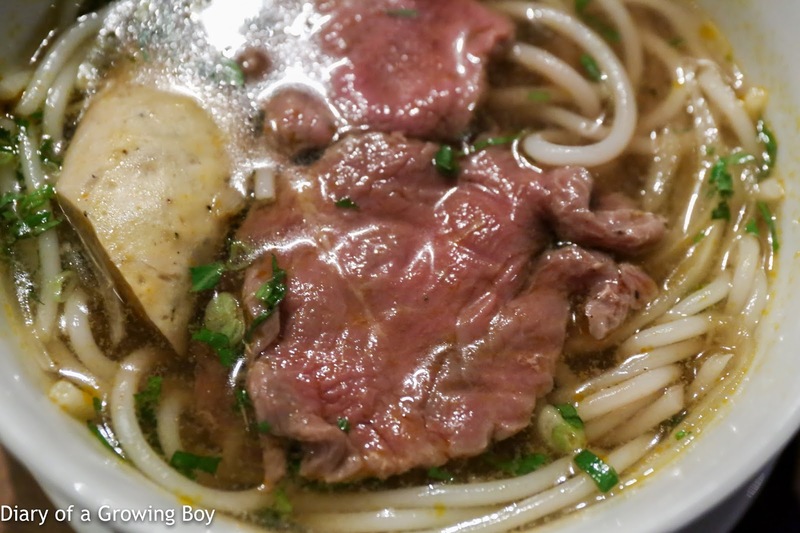 Most people who write about their food experiences in HCMC seem to focus on the cheap and cheerful stuff, which was a little disappointing for me. 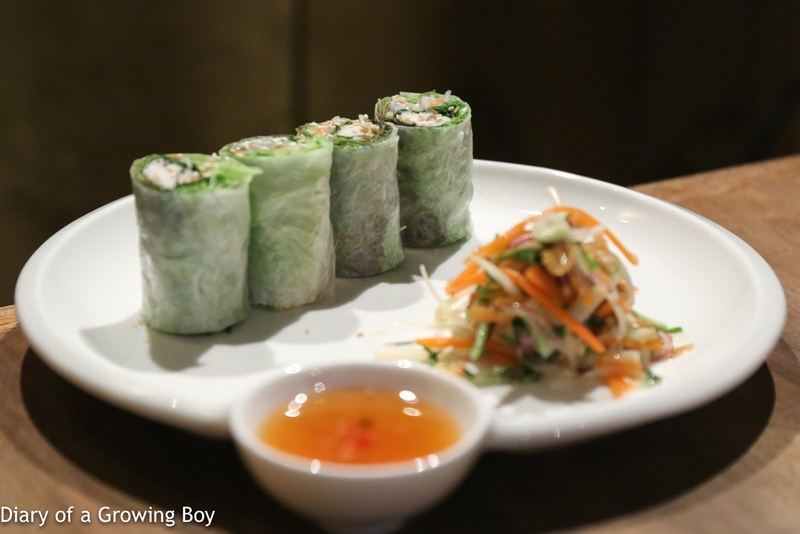 Very few people who write about food seem to have been to Xu Restaurant and Lounge. It looked interesting and the menus seemed to have been well thought out, presenting traditional Vietnamese flavors with modern ingredients - the kind of stuff that I really dig. I was having trouble finding meaningful reviews of this place - especially since I can't read Vietnamese - until Hello Kitty pointed me to TripAdvisor. Normally I stay away from crowd-sourced review sites when it comes to restaurants, but in this case TripAdvisor gave me enough info, both positive and negative. Fearing the experience to be a disappointment, I asked our hotel concierge to book us for lunch instead of dinner. We should have come for dinner. We got ourselves a table in the lounge downstairs, which was almost empty. Cigar smoke lingered in the room, which was just as well since it covered some of the unpleasant smell of the space. We asked for the password to the restaurant's wifi network, and we were told that it was "porkbelly". This was obviously cheeky, and instantly earned brownie points with us. We decided to order one set lunch plus a couple of dishes à la carte and share everything. This worked out reasonably well for us. I had asked the staff if we could have the dinner tasting menus at lunch, but unfortunately this was not possible. Gỏi cuốn cá chẽm - the fresh seabass spring roll was stuffed with rice vermicelli, coriander, and other herbs, and served with sweet and sour nước mắm. I wanted something a little out of the ordinary, and the soft shell crab version would have come deep-fried and maybe felt a little greasy. 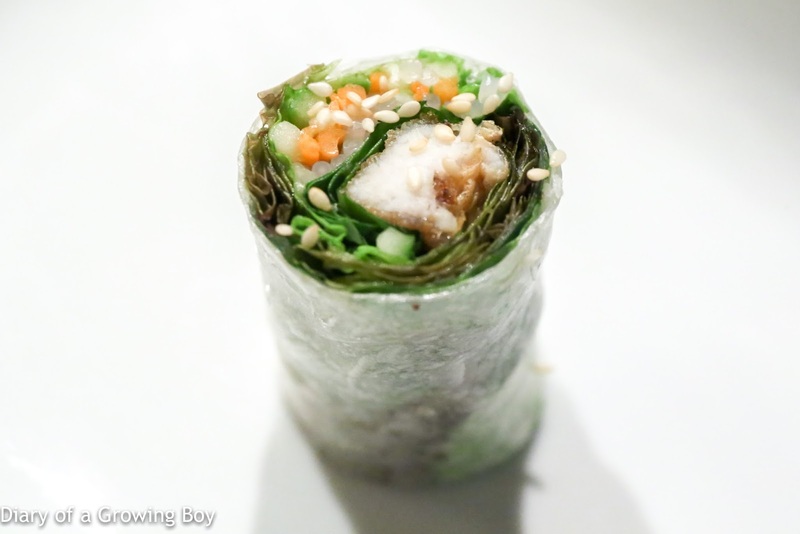 This had cleaner flavors, perhaps some would even argue that it was bland, but the herbs, sesame, and nước mắm would have made up for any shortfall in flavor from the seabass. 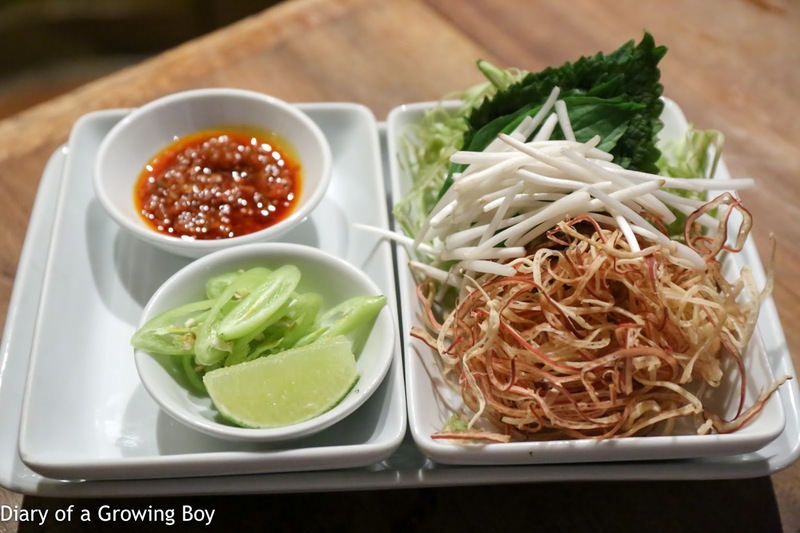 ...and of course this came with the usual selection of herbs, including shredded banana blossom, bean sprouts, spring onions, perilla leaves, chili, lime... etc. For the set lunch, I started with gỏi vịt bắp cải. 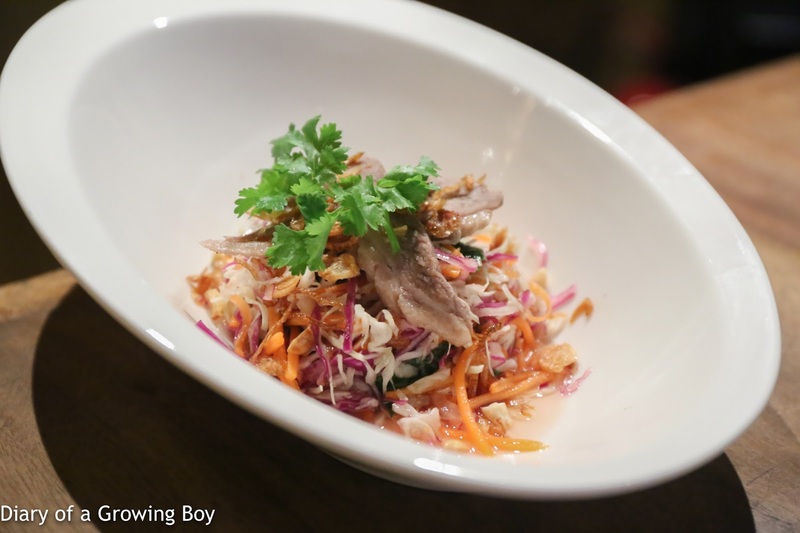 This duck salad came with cabbage, pickles, shallot, peanuts, and a ginger fish sauce. Slightly on the sweet side. The duck was a little dry, but tasted fine together with the rest of the ingredients. 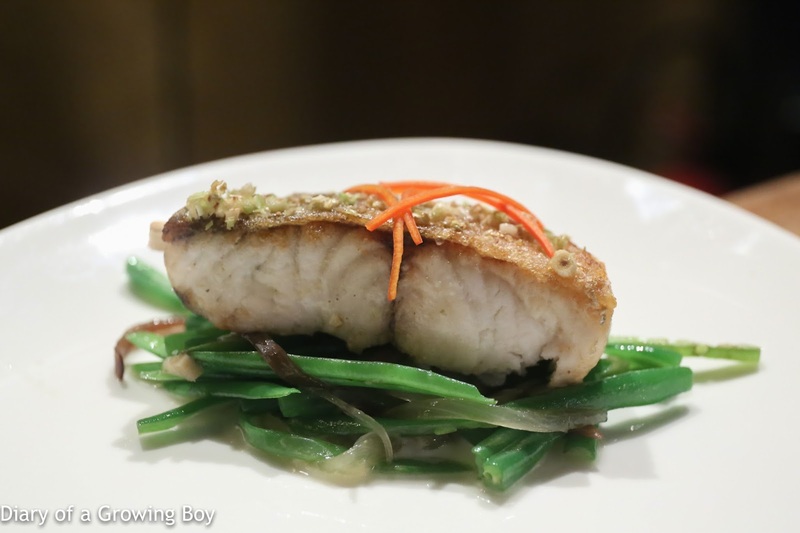 Cá chẽm nướng xả - the seabass came with a lemongrass skewer, with fish sauce-flavored crispy skin on top. Served with a tiny bit of kaffir lime leaf scented coconut milk, on a base of haricot verts, onion, and wood ear. While the fish itself was not dry, I think it would have been more interesting if there was more of the coconut milk sauce to lend a more Southeast Asian flavor. It was just too light for my taste. Thịt ba rọi rim nước dừa - this coconut braised pork belly was AWESOME. It was just so, so, so tasty!!! We were very, very happy to have had a taste of this... Soooo much fatty goodness! 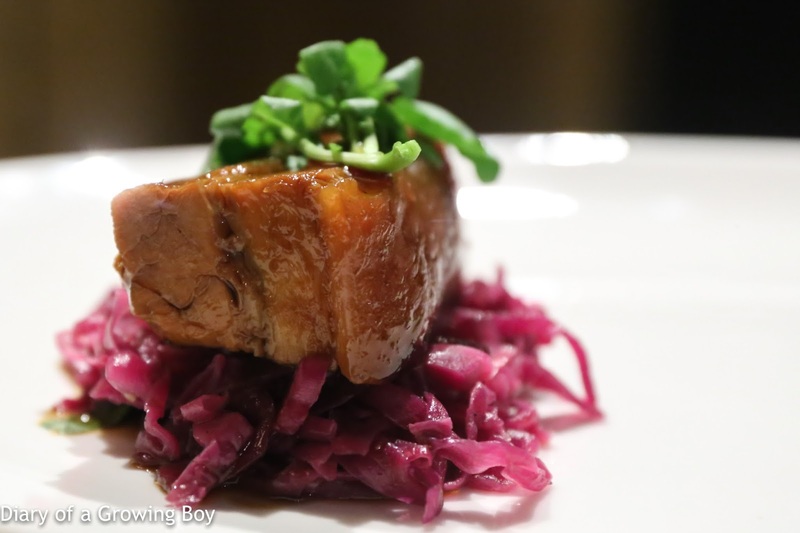 The "sauerkraut" at the bottom was made with red cabbage, daikon, and coriander. It was only a little sour, with just enough acidity to help balance the richness of the pork. Finally, the Xu dessert taste at the end of the set lunch menu. 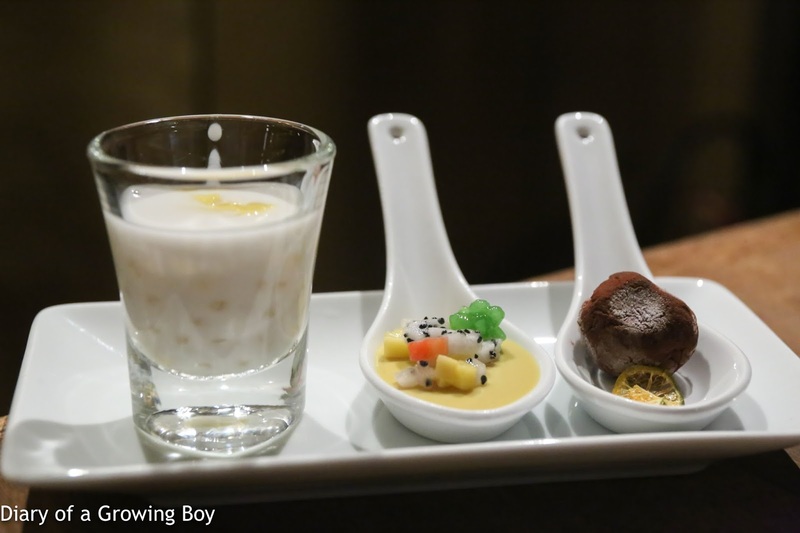 A trio of chè bột báng nước cốt dừa (coconut chè), bánh xoài sữa và trứng (mango mousse), and bánh sô cô la sữa và tắc (chocolate kumquat truffle). This was a pretty good meal, which made me deeply regret not following through with my original plan of having dinner here. Now I'm really curious about the tasting menus for dinner, with the chef presenting dishes from different regions of the country. As we left the restaurant with smiles on our faces, we told ourselves that we will definitely be back on our next trip to Ho Chi Minh City.